Butterfinger and AOR GolinHarris broke new ground on the consumer-engagement front with Butterfinger the 13th, an original comedy-horror short film. 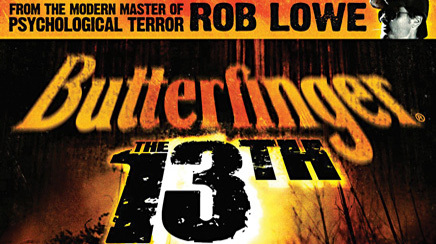 Butterfinger and AOR GolinHarris broke new ground on the consumer-engagement front with Butterfinger the 13th, an original comedy-horror short film. Directed by Rob Lowe, the film premiered October 13 on Facebook, ran in 500 theaters nationwide, and is available on partner Sony's FEARnet and Crackle platforms. "We've been trying to not only interrupt consumers, but also provide valuable content and engagement," explains Butterfinger brand manager Jeremy Vandervoet. "We wanted to go beyond the traditional 30-second spot and use digital and PR to engage and provide something different. Our target audience is digitally savvy and consuming media in different ways." Nestlé Confections & Snacks' communications manager Tricia Bowles notes Butterfinger has always been an "edgy, fun" brand known for innovative programs. The idea was to create the movie with a celebrity director and drive engagement through multiple channels during all production stages. Vandervoet says Lowe's extensive entertainment industry experience, intelligence, and sense of humor made him a perfect fit to direct and poke fun at the entertainment industry in behind-the-scenes videos. "We're clearly making fun of pop culture, directors, actors, and the egos involved," he adds, "yet we were really creating a movie. Part of it's very real and we promoted it as very real, but we never take ourselves too seriously." A Comic-Con appearance, a consumer generated-content contest, social media outreach, and media relations also drove engagement. The team announced the film and Lowe as director on May 13. Entertainment Tonight and The Insider were given exclusive access. Additional announcements were made on the 13th of each month through October. Promotional assets and up-dates were released on a rolling basis through Butterfinger's Facebook, Twitter, and YouTube properties. FEARnet and Crackle also promoted the film on their social media properties. About 16 promotional videos were released. They include "making of" clips that send up Hollywood stereotypes, a trailer, and Lowe calling for Facebook submissions of original video scenes, music, and artwork for a chance to win inclusion in the film, cash, and a screen credit. Lowe also appeared at Sony's Comic-Con booth and filmed a movie scene that included convention attendees. Entertainment and general consumer media, blogs, and entertainment and marketing trades were targeted. Materials released to the media included script synopses, clapboards, and trivia about Lowe. The film premiered October 13 at 1pm (the 13th hour) on Facebook and opened in theaters that night. A premiere event for the movie's cast, fans, and media was held at LA Live in downtown Los Angeles. From May to October, Butterfinger sales rose 2.5% compared to the same period in 2010. "It was a phenomenal success from a metrics standpoint," says Vandervoet, "and it changed how senior management thinks about communications." Facebook likes increased from 770,000 in May to almost 1.1 million as of November, while Twitter followers went up from 2,000 to 8,000. Media impressions topped 500 million (the stretch goal was 100 million). Outlets covering the story included CNN, MTV.com, and USA Today. A new integrated campaign will launch in 2012, though no details are available. This was certainly an innovative campaign that was well executed and well aligned with Butterfinger's brand identity. Rob Lowe was also a perfect celebrity with whom to work. He's a big draw who provided the needed gravitas and levity for the campaign. This team was savvy in creating content to keep consumers engaged for six months. Premiering the film on Facebook was a wonderful use of the medium. It was also smart to ensure the movie was available on cable channel FEARnet and digital network Crackle, as well as in theaters.